A windscreen can serve two purposes; to keep the icy blasts of winter off the rider, and to improve the appearance of the bike. Sometimes they perform only one of these functions, and sometimes both. Some small windshields look good but are virtually useless if you are looking for protection. In fact, a poorly fitted one can be worse than useless because it can have a bad effect on handling at speed, direct unpleasant buffeting blasts of air at your helmet, and also collect dust and dirt. A decent sized screen comes into its own on a long trip, especially in colder weather when protection from the elements is important. It keeps the direct blast of air off your body from the waist upwards, including the head and arms. Consequently you will suffer much less heat-loss in cold weather, and be protected from the messy and painful impact of insects, hail, rain or grit. However, you don't sit in a pocket of utterly still air. The only drawback of a windshield is that it causes more air drag, which increases fuel consumption slightly. However this is a small price to pay for the comfort, safety and protection that it offers. The stock screen on the ST1100 is 16.5" high. Because I'm 6'2" tall, I found that at motorway speeds the wind noise and buffeting my helmet was receiving was not very pleasant, and when it rained it was as though I had no windscreen at all. 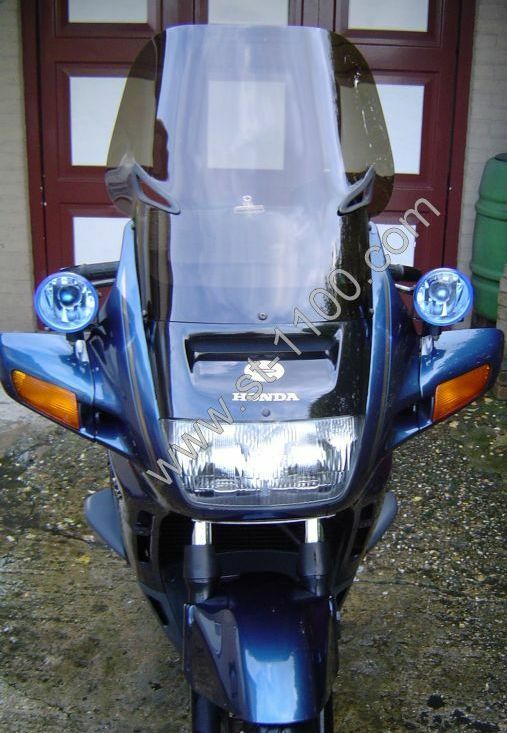 Now unlike the Honda ST1300, which has an electrically-adjustable windshield, the only way to adjust the screen on the ST1100 is to change it completely. There are several online manufacturers of aftermarket windshields. TIP: Once you've washed your bike, use an aerosol furniture polish, not only on the plastic parts, but also on the windshield. Buff with a soft cloth. Dirt will come off a lot easier from a polished surface ;). Also, "wet wipes" are quite good at removing road grime from your windshield when you don't have access to soap and water. If you don't particularly want to install a taller screen, another product is reputed to solve the wind buffeting problem. It interrupts the airflow by means of a type of aerofoil. You can read all about it here. Conclusion: I'm quite pleased with my taller screen. Although it gets covered with spray and road grime, my helmet visor stays fairly clean. There is still a bit of wind noise, but it is much reduced.